Are you a fan of witches, snappy dressing and… an endless rain of bullets? Then Cardboard Keep’s story-driven bullet hell shooter, Witch Thief, will probably take your fancy. You play a sassy witch on a quest to steal an enchanted grimoire from the mysterious doll maker and his minions. There are three more playable witches to unlock, each with their own abilities and unique story. You’ve got endless bullets, they’ve got endless bullets. It’s a match-up made in heaven. Or hell. You can adjust the difficulty to suit your skills or mood, change perspective between 2D and 3D, explore the five distinct zones or battle for eternity in Endless Dungeon Mode. 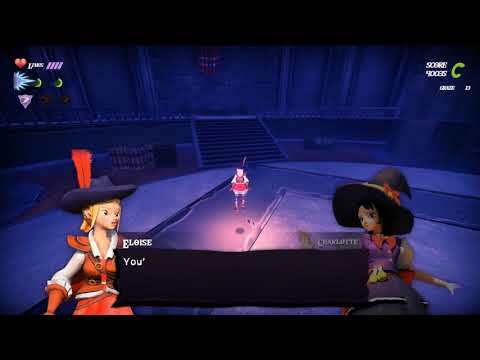 Witch Thief will be available for Nintendo Switch from 19th April 2019, and is currently available on Steam. Did you just mention that we can change difficulties? No wonder this site is hollow. Having an option to make the game easier means people who normally wouldn't purchase a bullet hell type game might consider it. Or maybe they have kids who would like the game but can't enjoy the game if it is too tough. For a notoriously challenging genre, it's a relevant piece of info.